To Cite: Moradan S, Hosseinzadeh B. Endometrial adenofibroma; A Case Report, Middle East J Rehabil Health Stud. Online ahead of Print ; In Press(In Press):e90184. doi: 10.5812/mejrh.90184. Introduction: Adenofibroma is a type of mixed mesodermal tumor that both epithelial and stromal components are benign, and often originate from endometrium at postmenopausal age. Uterine adenofibroma is an extremely rare tumor and this lesion must be differentiated from some benign or malignant lesions of the uterus, particularly adenosarcoma. Because of the rarity and importance of such histopathology at post-menopausal age, this case is presented. Case Presentation: A 63-year-old woman, parity 9, who was at menopause period with a history of prolonged and severe no bloody vaginal discharge during the past 3 months was referred to our center. Transvaginal ultrasonography revealed a hyperechoic area with the dimensions 65 × 37 × 33 mm inside the endometrial cavity, that was suspicious to severe endometrial hyperplasia or malignancy. Tumor marker tests (BHCC, LDH, αFP, CA125, CA19-9, and CEA) were in normal limit. Endometrial biopsy by pipelle was unsatisfactory for diagnosis. Total abdominal hysterectomy was done, and the result of histopathology confirmed endometrial adenofibroma with the dimensions 70 × 47 × 40 mm. Conclusions: The presence of a hyperechoic area of the endometrium with complain of prolonged vaginal discharge in post menopause subjects could attribute to endometrial adenofibroma. Some of the endometrial lesions during the menopause period may be benign and adenofibroma and it may be one of the rare tumors affecting the female genital tract that first reported by Abell in 1971. The origin of the tumor is from either the uterus or cervix in most cases (1). The endometrium is the origin in most cases and cervix is affected in 10% of the cases (2). This uncommon Müllerian mixed tumor consists of benign epithelial and mesenchymal elements (3). Cervical adenofibromas are usually observed in women at pre- or post-menopausal age and typically their presentation is abnormal vaginal bleeding (1). However, an asymptomatic case of a 32-year-old woman that presented with intracervical multicyclic mass and was diagnosed as endometrial adenofibroma based on histopathologic findings and transvaginal ultrasound (4). Adenofibroma is a benign biphasic tumor classified into the mixed epithelial and mesenchymal tumors (5). In cases with adenofibroma some differential diagnosis, particularly malignant lesions, must be considered. The differential diagnoses are adenosarcoma, adenomyomas, carcinosarcoma (1), and benign endometrial polyps (6). It is possible that serous carcinoma, as well as endometrial intraepithelial carcinoma with involvements of the endometrium and cervix, were generated in an endometrial adenofibroma in a woman at menopause age (7). One of the unusual presentations of uterine adenofibroma in post-menopause women is uterine inversion (2). Another rare presentations of endometrial adenofibroma at post-menopause age is a papillary Aden fibromatous uterine cyst or arising of it from the endometriotic cyst (8, 9). However, the preoperative diagnosis of this rare tumor is usually very difficult. In this regard, a combination of MRI, CT scan, and ultrasonography are introduced as useful diagnostic tools (5). Conservative treatments such as curettage or polypectomy for Müllerian adenofibroma are not enough due to the probability of the recurrent nature of these tumors. Therefore, hysterectomy is the treatment of choice in cases with adenofibroma at post-menopausal age in order to complete excision and to obtain a sample to exclude adenosarcoma (10). Because this is a rare endometrial lesion, the probability that these lesions develop a malignant tumor, and their potential complication we present this case. A 63-year-old woman, parity 9, with initiated menopause at 5 years ago and a history of prolonged no bloody vaginal discharge during the past 3 months was referred to our clinic. She has a history of rheumatoid arthritis from 3 years ago and used chloroquine and prednisolone tablets daily. In the pelvic examination, there was no visible or palpable abnormality and the vital sign of the patient was normal at that time. She underwent transvaginal ultrasonography and it revealed a normal size uterus, atrophic ovaries, and a hyperechoic area with the dimensions 65 × 37 × 33 mm inside the endometrial cavity and it contained lots of vesicular areas suspicious to severe endometrial hyperplasia or malignancy. Laboratory tests consisted of complete blood count and serum BHCG level for rule out of choriocarcinoma and the other tumor markers, including LDH, CA125, Alpha fetoprotein, CA19-9, and CEA were in normal ranges. Pap smear of the patient was negative for the presence of intraepithelial neoplasia or malignancy and had an atrophic pattern. Outpatient endometrial biopsy by pipelle was performed and the result was unsatisfactory for diagnosis. Because the patient was suspected to have malignancy based on ultrasonographic findings, she underwent a total abdominal hysterectomy in addition to bilateral salpingo-oophorectomy. Frozen sections of the tissue sample during the surgery showed a benign nature for endometrial mass, after removing the uterus, intrauterine mass easily was separated from uterine cavity and the result of final histopathology confirmed an endometrial adenofibroma with the dimensions 70 × 47 × 40 mm (Figures 1 and 2). Informed consent was obtained from the patient in this case report study. Oshima et al. reported a case of endometrial adenofibroma in a 69-year-old woman that she was on treatment with tamoxifen following breast cancer surgery. They indicated an endometrial mass containing multiple cystic lesions by magnetic resonance imaging. They suggested that adenofibroma is a possible diagnosis in patients with multiple cystic lesions in the endometrial cavity with no clinical evidence of malignancy (11). Our case was a 63-year-old woman and she was on treatment with chloroquine and prednisolone tablets due to rheumatoid arthritis. Subsequently, multiple cystic lesions inside the endometrial cavity were shown by sonography and similar to Oshima et al. case report, the final diagnosis was endometrial adenofibroma. Akbulut et al. study reported a total abdominal hysterectomy in a 60-year-old woman for keratinizing large cell carcinoma of the cervix that incidentally an endometrial polypoid mass 1.5 cm in maximum diameter was found, which the mass was introduced as a lipoadenofibroma (12). Our case was a 63-year-old woman and in contrary to Akbulut et al. case that the mass was the polypoid type, our case had multiple cystic lesions inside the endometrial cavity and there was no lipid component in the mass. Bellil et al. 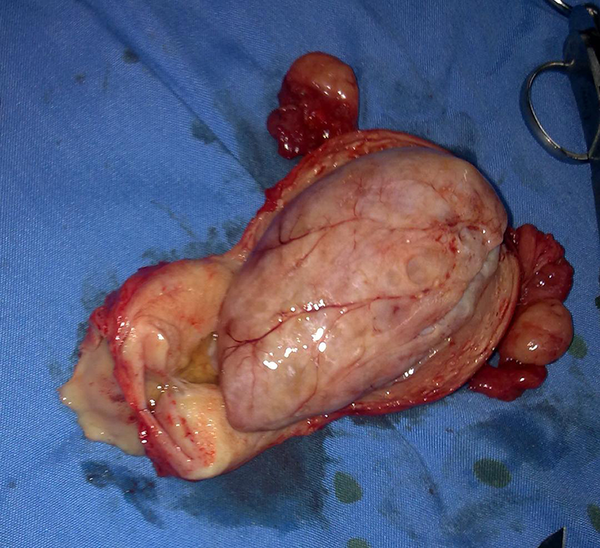 reported a 31-year-old woman with papillary adenofibroma of the uterus who was referred with vaginal bleeding and her pelvic examination revealed a large protruded polypoid mass through the cervix. Pelvic ultrasound showed that the origin of the mass was the uterus and polypectomy was done. Similarly, the tumor was a benign adenofibroma. They concluded that uterine adenofibroma is an extremely rare benign mixed tumor with the Müllerian origin and this lesion must be differentiated from some malignancies of the uterus such as adenosarcoma (13). Haque et al. reported a polypoid adenofibroma during the survey of carcinoma in situ of the cervix in a 33-year-old woman that was detected by MRI. However, the lesion was a pedunculated benign mass, disruption of "junctional zone" in the posterior myometrial wall of the uterus was shown by T2-weighted MR images that the pattern was a myometrial invasion by endometrial carcinoma mimics (14). The age of detection of endometrial adenofibroma of these two studies is lower than our case. The pattern of presentations of them was polypoid but in our case, it was a multiple cystic nonpolypoid lesion. Gallardo and Prat suggested that some of the tumors that were classified as adenofibromas, based on their low mitotic activity and lack of significant nuclear atypia were in fact well-differentiated adenosarcomas (15). Adenosarcoma, adenomyosis, carcinosarcoma (1), and also benign endometrial polyps (16) are the differential diagnosis of adenofibroma. In our case based on the age of the patient and ultrasound findings, the probability of malignancy was considered before the operation, but fortunately, the final histopathologic survey showed a benign nature of the endometrial lesion. Tamoxifen therapy is considered to be a risk factor for some of the endometrial lesions such as adenofibroma and endometrial stromal sarcoma. Hayasaka et al. described the MRI findings of adenofibroma and endometrial stromal sarcoma associated with tamoxifen therapy. They concluded that when MRI demonstrates a uterine heterogeneous mass in the endometrium or myometrium, adenofibroma, and endometrial stromal sarcoma must be considered a rare diagnosis (17). Our case was on the tamoxifen therapy and she was on the treatment with chloroquine and prednisolone tablets due to rheumatoid arthritis. There is no study until now for consideration of these two drugs as a risk factor for endometrial adenofibroma. The preoperative diagnosis of endometrial adenofibroma usually is very difficult and the combination of MRI, CT scan, and ultrasonography are introduced as a diagnostic tool (5). In our case the diagnosis of the lesion was made by ultrasound, but similar to most of the other studies, the definite diagnosis was based on the histopathologic findings. Hayasaka et al. showed that because Müllerian adenofibroma is associated with recurrence, and that conservative treatments such as curettage or polypectomy are suboptimal; therefore, the treatment of choice in women with adenofibroma was hysterectomy at any age in order to complete excision and to obtain a thorough sample for ruling out the adenosarcoma (17). 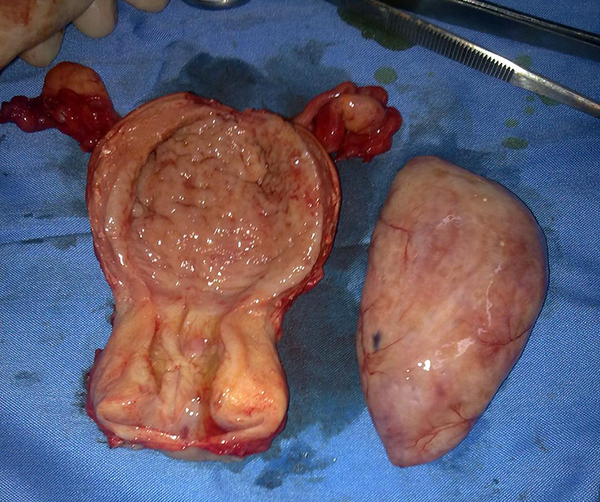 In our case also the patient underwent a total abdominal hysterectomy in addition to bilateral salpingo-oophorectomy. Subsequently, frozen sections of the tissue sample during surgery did not show malignancy and the result of final histopathology confirmed benign endometrial adenofibroma. In conclusion, prolonged no bloody vaginal discharge with the presence of hyperechoic mass inside a women’s endometrium at post-menopause age may be a benign endometrial adenofibroma and more studies should be conducted to evaluate the effect of chloroquine and prednisolone as risk factors for endometrial adenofibroma. Conflict of Interests: The authors declared that there is no conflict of interests for this study. Funding/Support: The authors declared that there is no funding support for this study. Patient Consent: Informed consent was obtained from the patient in this case report study. 1. Chu IL, Chen CL, Hsu CS. Adenofibroma of the uterine cervix coexistent with endometriosis. Taiwan J Obstet Gynecol. 2012;51(2):285-8. doi: 10.1016/j.tjog.2012.04.022. [PubMed: 22795111]. 2. Chawla L, Vatsa R, Roy KK, Kumar S. Uterine adenofibroma: An unsual cause of nonpuerperal uterine inversion in postmenopausal female. J Midlife Health. 2017;8(2):95-7. doi: 10.4103/jmh.JMH_27_17. [PubMed: 28706412]. [PubMed Central: PMC5496288]. 3. Bettaieb I, Mekni A, Bellil K, Haouet S, Bellil S, Kchir N, et al. Endometrial adenofibroma: A rare entity. Arch Gynecol Obstet. 2007;275(3):191-3. doi: 10.1007/s00404-006-0196-1. [PubMed: 16858575]. 4. Maciel R, Carvalho S, Teixeira M, Areias MJ. Adenofibroma in a young patient: A rare entity in an uncommon age. Case Rep Obstet Gynecol. 2013;2013:308464. doi: 10.1155/2013/308464. [PubMed: 24459594]. [PubMed Central: PMC3888707]. 5. Konishi Y, Sato H, Fujimoto T, Tanaka H, Takahashi O, Tanaka T. Adenofibroma of the endometrium protruding into the vaginal cavity: Findings on transvaginal ultrasonography, MRI and CT. J Obstet Gynaecol Res. 2006;32(6):623-7. doi: 10.1111/j.1447-0756.2006.00467.x. [PubMed: 17100829]. 6. Huang KT, Chen CA, Cheng WF, Wu CC, Jou HJ, Hsieh CY, et al. Sonographic characteristics of adenofibroma of the endometrium following tamoxifen therapy for breast cancer: Two case reports. Ultrasound Obstet Gynecol. 1996;7(5):363-6. doi: 10.1046/j.1469-0705.1996.07050363.x. [PubMed: 8774105]. 7. Venkatraman L, Elliott H, Steele EK, McClelland HR, McCluggage WG. Serous carcinoma arising in an adenofibroma of the endometrium. Int J Gynecol Pathol. 2003;22(2):194-7. doi: 10.1097/00004347-200304000-00014. [PubMed: 12649677]. 8. Darwish AM, Ali MK, Omar AE. A rare fundal papillary adenofibromatous uterine cyst in a postmenopausal woman: A first case report. Eur J Obstet Gynecol Reprod Biol. 2017;213:148-9. doi: 10.1016/j.ejogrb.2017.04.026. [PubMed: 28455157]. 9. Jain D, Siraj F, Aggarwal N. Endometrioid adenofibroma arising in an endometriotic cyst. J Obstet Gynaecol. 2011;31(4):352-4. doi: 10.3109/01443615.2011.562333. [PubMed: 21534769]. 10. Skorupskaite K, Al-Nafussi A, McKillop G. Diagnostic challenges in a rare case of mullerian adenofibroma of the uterus: Instructive case and literature review. Diagnost Histopathol. 2011;17(12):557-61. doi: 10.1016/j.mpdhp.2011.10.004. 11. Oshima H, Miyagawa H, Sato Y, Satake M, Shiraki N, Nishikawa H, et al. Adenofibroma of the endometrium after tamoxifen therapy for breast cancer: MR findings. Abdom Imaging. 2002;27(5):592-4. doi: 10.1007/s00261-001-0098-4. [PubMed: 12173004]. 12. Akbulut M, Zekioglu O, Terek MC, Ozdemir N. Lipoadenofibroma of the endometrium: A rare variant of benign mullerian mixed tumor. Arch Gynecol Obstet. 2008;278(3):283-6. doi: 10.1007/s00404-008-0572-0. [PubMed: 18236054]. 13. Bellil K, Haouet S, Ben Fadhel C, Kchir N, Chelli H, Zitouna M. [Endometrial adenofibroma]. Gynecol Obstet Fertil. 2001;29(6):447-50. French. [PubMed: 11462961]. 14. Haque TL, Togashi K, Koyama T, Fujii S, Konishi J. An unusual presentation of endometrial polyp. Eur Radiol. 2002;12(12):2906-9. doi: 10.1007/s00330-002-1327-0. [PubMed: 12439569]. 15. Gallardo A, Prat J. Mullerian adenosarcoma: A clinicopathologic and immunohistochemical study of 55 cases challenging the existence of adenofibroma. Am J Surg Pathol. 2009;33(2):278-88. doi: 10.1097/PAS.0b013e318181a80d. [PubMed: 18941402]. 16. Hattab EM, Allam-Nandyala P, Rhatigan RM. The stromal component of large endometrial polyps. Int J Gynecol Pathol. 1999;18(4):332-7. [PubMed: 10542941]. 17. Hayasaka K, Morita K, Saitoh T, Tanaka Y. Uterine adenofibroma and endometrial stromal sarcoma associated with tamoxifen therapy: MR findings. Comput Med Imaging Graph. 2006;30(5):315-8. doi: 10.1016/j.compmedimag.2006.06.001. [PubMed: 16890405].